The Who Was Biographies are a series of books that I wish I had known about with my older two children! They are a series of books (with new titles still being added) that include biographies of people as well as a closer look at places, and events both in history and currently. This series of inspiring, illustrated biographies is perfect for elementary to young middle-grade readers. 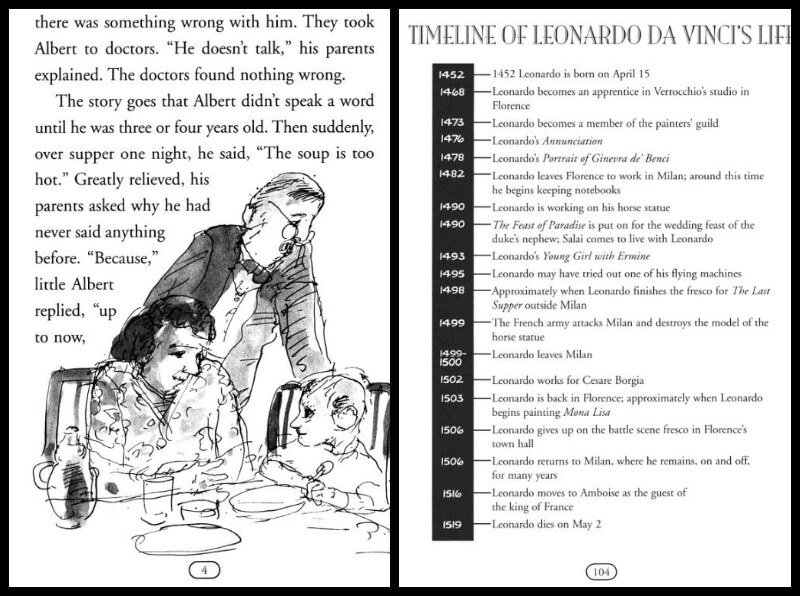 Each biography is complete with facts, interesting anecdotes, and compelling black-and-white illustrations. Sidebars on related topics, a timeline, and a bibliography enhance readers understanding of each person. This set will match your readers who are beyond easy-to-read but not quite ready for long, detailed nonfiction. 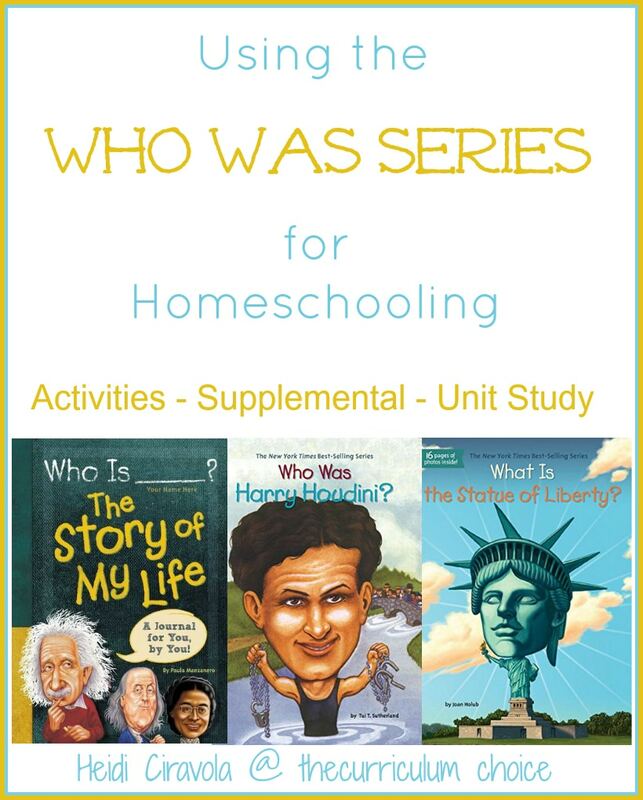 The Who Was Series are illustrated biographies geared towards grades 1-6. These are chapter books of around 100 pages in length that include black and white illustrations, timelines, and where appropriate even basic maps. You can visit the Who Was Book Series website to find lists of books, play fun Who Was trivia and they even have a “My Bookshelf” section where you can keep track of the books you have read and the books you want to read. Not only does it save your lists, but you can even e-mail or print them! My 10 year old daughter also loves to play the Who Was? Adventure App on our iPad! It takes you through a series of people. Click on their caricature head to see a timeline and a couple of facts pertaining to that person. Then answer 8 questions right to move on to the next one. 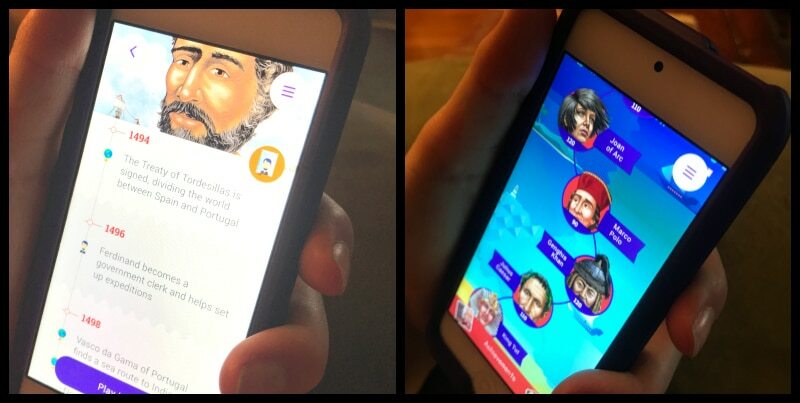 For starters Who Was offers three other fun, interactive ways to use the Who Was series besides their app and website. The Who Was? Activity Book – Puzzles, mazes, quizzes, and brain-busting challenges based on the New York Times best-selling Who Was…? series. Can you paint like Picasso? Write like Shakespeare? Solve a puzzle as fast as Einstein? Go head-to-head with your favorite Who Was…? characters and leave your mark on history with this fun and exciting activity book. Includes three pages of full-color stickers! Who Was? Mad Libs – It features 21 original stories about some of the most popular subjects in the series, from Abraham Lincoln and Marie Curie to Jeff Kinney and Bruce Lee. Who Is_______? The Story of My Life – This fun and interactive journal prompts kids to record their own life stories. Each illustrated spread focuses on different topics – from birth and the toddler years up to the present and dreams for the future. Create your own family tree, list your BFFs, pets, and favorite subjects, food, and hobbies. When completed, readers will have an up-to-the-minute autobiography that is right at home among our other legendary Who Was…? titles. Are you studying an artist? A President? Black History? There are hundreds of titles to choose from. We often pull the MLK Jr. one as a refresher around MLK Jr. Day, or read about an artist when we are working on a piece inspired by them. These make great books for younger ones to read when the older ones are doing something more in depth. You can also create entire unit studies around the Who Was Series books. For instance how about studying music? There are musicians like Elvis Presley, Mozart, Lois Armstrong, and the Beatles. You can use these books to read and discover, along with listening to music about these musicians, and learning more about their genre of music. Or you can create an entire course around it like I did! This year my 5th grader is using the Who Was Series Biographies for history. I made an entire lesson plan by grouping different books together, and then created a notebook printable for her to use. She is creating an entire Who Was history notebook this year covering topics like New York State Landmarks, U.s President, Women in History, Explorers and more! 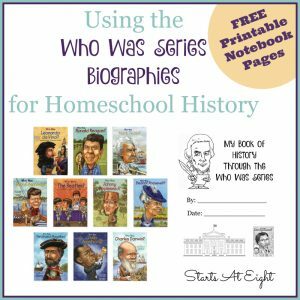 Check out my Using the Who Was Series Biographies for History and get the notebook printable for FREE! These look great! My son is currently in 8th grade and a reluctant reader. I’ve been looking for more biographies so these may be just what I’ve been looking for!